Tumor cells use a certain type of immune cell, so-called neutrophils, to enhance their ability to form metastases. Scientists from the University of Basel and the University Hospital of Basel have deciphered the mechanisms of this collaboration and found strategies for blocking them. The results are published in Nature. 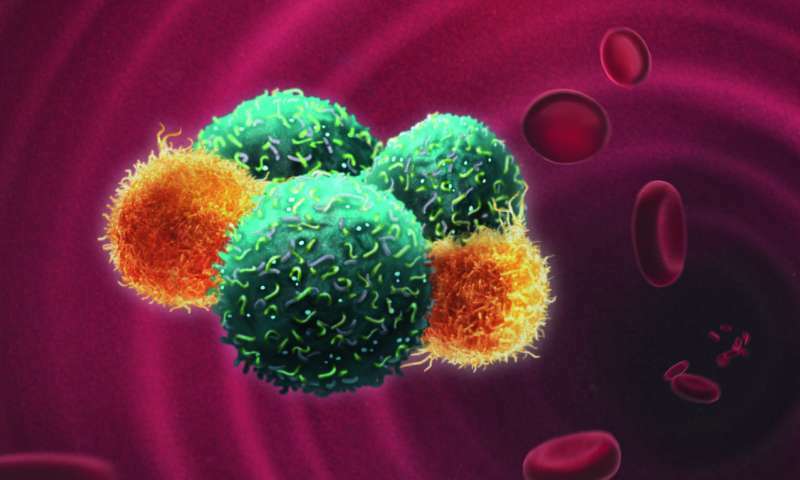 A better understanding of the features that define the interplay between cancer cells and immune cells is key to identifying new cancer therapies. Yet, focus is often given to those interactions that occur within the primary tumor and its microenvironment, while the role of immune cells during cancer dissemination in patients remains largelyuncharacterized. For example, certain immune cells, the so-called neutrophils, often enter into an alliance with tumor cells that contributes significantly to the development of metastases. This was reported by Prof. Nicola Aceto's interdisciplinary research team at the Department of Biomedicine of the University of Basel and the University Hospital of Basel. Circulating tumor cells (CTCs) are cancer cells that leave a primary tumor and enter the bloodstream on their way to distant organs. These CTCs are regarded as precursors of metastases. They can be found in the blood of patients as single cells, cell clusters or in groups with neutrophils. The researchers discovered that CTCs in close contact to neutrophils proliferate much more than other circulating cancer cells. "Surprisingly, the patient's own neutrophils act by protecting CTCs in circulation, allowing CTCs to more efficiently seed metastasis," says Prof. Aceto. Indeed, the presence of CTC-neutrophil clusters in the bloodstream also correlates with a poor prognosis of breast cancer patients. "We undertook a number of experiments to fully characterize CTC-neutrophil clusters from patients and mouse models, aiming to find strategies to suppress their ability to form metastasis," says Prof. Aceto. To this end, the researchers combined state-of-the-art single cell sequencing techniques, microfluidic technologies and genetic knockout experiments to gain insights into the biology of CTC-neutrophil clusters. They found that the neutrophils enhance the metastasis-seeding ability of CTCs by releasing specific messenger substances, such as cytokines. When in turn this release of cytokines was blocked, the pro-metastatic effects of neutrophils were abrogated.